There has been no end to the bookish expeditions around here lately. Our latest one was a big one: a trip to Portsmouth, New Hampshire, to see Stephen King. I heard about the one and only book signing he agreed to do for his new book Full Dark, No Stars from Michele Filgate on Twitter, who works at RiverRun bookstore in Portsmouth. I also had heard that Portsmouth is a cute city, so I suggested to Hobgoblin that we go, and he happily said yes. He is the real Stephen King fan in the house; I’ve read only one novel of King’s, The Girl Who Loved Tom Gordon, and that one only because it features hiking and the Appalachian Trail. I liked it, but mostly I’m not a fan of horror, as I scare too easily and don’t find being scared fun. But Hobgoblin has been a fan for years, is a member of the Stephen King Library, which automatically sends him a copy of his King’s books, and has collected every book he’s published. I know that was a special moment for Hobgoblin. 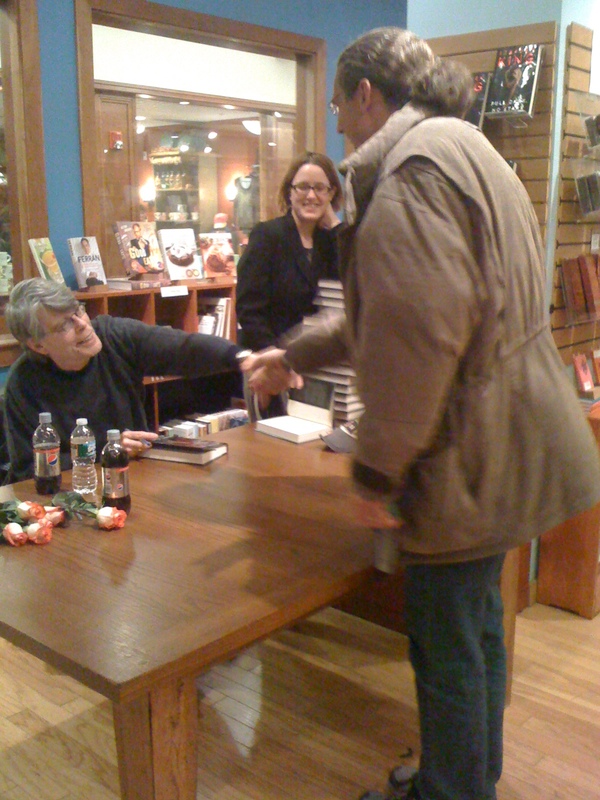 For me, I always like meeting authors, and it was great to meet one who is so famous and successful. From what I hear, King is one of the nicest famous authors out there as well. He seemed to be enjoying meeting his fans and to have limitless energy, although he signed something like 450 books, and that’s a lot. He seems to know that people are really excited to meet him and to want to make sure they have a good experience. Afterward, we went to a cafe two doors down the street to eat chocolate cake and gloat over our books. Everybody else in the cafe had copies of King’s book as well, as did everybody walking down the street. A man sitting at a nearby table struck up a conversation with us about King and all the signings he’s been to and his room devoted mostly to King’s books. The atmosphere was celebratory, and it was fun. We stayed in Portsmouth until the next morning when we drove back home. I realized for something like the hundredth time how much I enjoy living in a place with so many interesting cities and towns and with tons of bookish destinations. And I thought about how much I hope I make it back to Portsmouth again before too long. I love hearing about your bookish expeditions and it sounds like you really have a lot of great places to choose from. I’ve only read one King novel–The Shining and yes, it was very scary (the movie, too!). I like suspense, but not too suspenseful or scary. It’s nice when an author is friendly–I’m sure they’re not all like that, but King really has a huge fan base and I’m sure he must appreciate that. Thanks for sharing photos–it sounds like a fun time! I’ve read almost everything King has put out, except “Tom Gordon.” He was my favorite author growing up. I read “Lisey’s Story” several years ago, and decided that I’d outgrown him. Then I read “Under the Dome” this year, and I really enjoyed it. It’s his best work in years. It’s nothing serious, just a popcorn book. You might give that a try. Or “Dolores Claiborne.” If you ask me, “DC” is his most literary work. I also wonder why people think his stuff is scary. Personally, I think his best strengths are characterization and humor. He’s funny. Even “Gerald’s Game,” which is basically a buried-alive book, is funny at times. Anyway, I’d love to meet King. I envy you. I am so jealous. I would love to meet Stephen King. 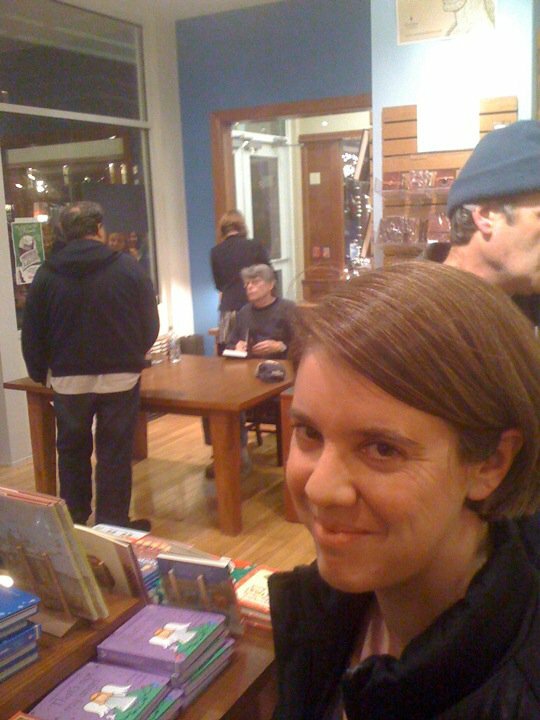 In interviews and his nonfiction, he really does seem like a genuinely nice guy, and it’s good to hear that the niceness came across at the signing. I agree with Brandon that not all of his work is scary. Some of it is terrifying, but some is more suspenseful and thoughtful. For me, it’s his ear for dialogue that makes him stand out. His characters sound like people. Anyway, I’m glad the signing was fun. I’ve seen Stephen King interviewed on tv. He looks like the kind of person who would write the books he does. I’ve read a couple of them, but like you, I get scared by horror and don’t enjoy the sensation. Aww how lovely! It sounds like you had a fabulous time. Stephen King and Portsmouth. What a fabulous combination. You were right near my old office. I spent at least one lunch hour everytime I was in Portsmouth to visit the office at RiverRun. I’ve been told they do a wonderful job with book signings. Nice to know there is a star author out there who is good to his fans. Isn’t Portsmouth such a cute town? My partner’s uncle and aunt live there, right next to the harbor and across the street from Strawberry Banke. We have our favorite places to visit & RiverRun books is always on the list, as is the Friendly Toast for lunch and the popover place for breakfast. We were in RiverRun books earlier this year when they were calling people who had signed up for tickets to the King event – it’s so fun to hear from you that it went so well! What a great time! I am so envious. I haven’t read many of King’s books but I have read a few–the ones that aren’t scary. My husband has read everything and many of them more than once. He is currently reading and enjoying King’s new book. And oh, how he would have loved to be in Hobgoblin’s shoes! What a great bookish expedition! I love how you described the afterwards too and how everyone was walking around with King books. That is just too cool. Danielle — yes, it does seem like he really appreciates his fans, which is nice. He seemed to enjoy doing the signing and making jokes with people. I think I liked that best about the whole thing. Brandon — Hobgoblin has said much the same things about King’s writing, so I really need to stop thinking of him as just a scary author. I don’t think I can read a buried alive book, though — that sounds awful! Teresa — you and other commenters are making me want to read more Stephen King! I went to a reading he did a few years ago, and what he read there wasn’t scary at all, but was really funny instead. I’ve also admired his writing about writing, which I forgot to mention in my post. Lilian — he does kind of look the part! Litlove — thanks, we really did have a great time, at the signing and visiting the town. Arti — I read On Writing a while back (forgot to mention it in my post) and liked it a lot. I teach his essays on writing in my classes sometimes, and the students like him. Emily B. — oh, I’d forgotten that you used to travel to Portsmouth all the time, but now I’m remembering you mention it. What a great place to work! And yes, they did a great job with this signing, and they seem to have a lot of good ones going on all the time. Emily — how fun to have family there! We went to the Friendly Toast for breakfast, and it was great. I think the popover place might have been where we got dessert. I envy you the excellent reason to visit there regularly! Stefanie — we are lucky to be able to take trips like this, and to live not too far away from places like Portsmouth. We drove past King’s house in Bangor, ME, last summer, which was fun. Perhaps I’ll have to pick up one of King’s books. Iliana — it really was fun. There was a very festive atmosphere there, and it was great to be a part of it all. Dorothy – I LOVED this post! I’ve had a schoolgirl crush on King since I read his lovely book On Writing almost 10 years ago. In it, he’s very folksy, talks about his own writing journey (starting with writing on a stool in his laundry room while his wife paid the bills working at Dunkin Donuts), and had great advice for writers. I’ve read parts of his book Just After Sunset – a great short story collection that is not too “horror”. More psychological. You might like that. Melissa — thank you! I really enjoyed On Writing too, and have taught excerpts of it in my classes. Students like him. It seems he writes things that are more psychological than really horror, which appeals to me. What a terrific experience. I would love to meet the author of one of my favorite books –> [The Stand]. And the On Writing book — I listened to the audio-version of it, [twice] with King himself doing the narration, and found it utterly fascinating, one of the best “writing” books ever.